If you look at home improvement magazines, you will notice the designer homes featured in them all have impressive outdoor kitchens and with good reason. 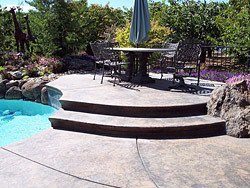 Extending your outdoor living areas is one of the best ways to significantly improve the function & form of your home. Our expert team brings its top industry experience to design and build features like outdoor patio kitchens to add dimension to your yard and extend your existing living space. The outdoor living trend has taken the home improvement industry by storm and a well-designed exterior kitchen becomes the perfect space to entertain guests and hold weekend BBQ parties too. The one way to ensure the best utilization of the available space is to hire the services of skilled and expert landscapers like us. Design West Landscaping is a premier landscape design and installation company providing customized service to businesses and homes across the East Bay and Northern San Joaquin Valley area. We consider it a matter of pride that a large number of residential property owners in and around Lodi, Stockton, and Elk Grove turn to us for all their outdoor kitchen design and build requirements. Since the design, layout, materials, and features in this space will be designed to your requirements, you can rest assured the setting will look just as you envisioned it to be. From a simple, single counter outdoor kitchen to an elaborate cooking space, complete with a pizza oven, built-in grill, a BBQ and multiple counters with plenty of seating space for guests, we can do it all. The creativity and skill with which our outdoor kitchen designers handle this job are what makes the end product stunning and appealing in every way. We use weather-resistant materials like pavers, natural stone, brick, concrete, and wood to achieve the right balance in appearance and form. Every feature will be purpose-built with your requirements in view. So whether you want a cozy stucco-finish fireplace or a custom designed seating wall added to the space, our team will handle the project expertly. We make sure that top grade products, fixtures, and materials are used in the work, so your outdoor kitchen can weather the climatic changes and outdoor environment. When you will settle for nothing but the best, the only company you need to approach is Design West Landscaping. Whether you want us to build a custom-designed outdoor kitchen from scratch or need one built on an existing patio or deck, our team will provide the best solutions. For any more information, outdoor kitchen cost queries or to discuss your project details, feel free to call us at 209-327-9661 or send us your requirements via this Contact Us form.